Everyone knows Patty Kondub. And everyone loves Patty Kondub. But she’s one of those people who everyone kind of takes for granted. We shouldn’t. Which is why Patty Kondub is this week’s Unsung Hero. Patty is many things. A 1981 Staples High School graduate — and proud University of Connecticut alum — she’s worked for the Westport Weston Family Y for 30 years. Members flock to her Aquafit classes. She works hard at researching and preparing lessons. But she always welcomes members with a smile, then makes every class fun. One day she’ll wear a costume; the next day she’ll announce a game. 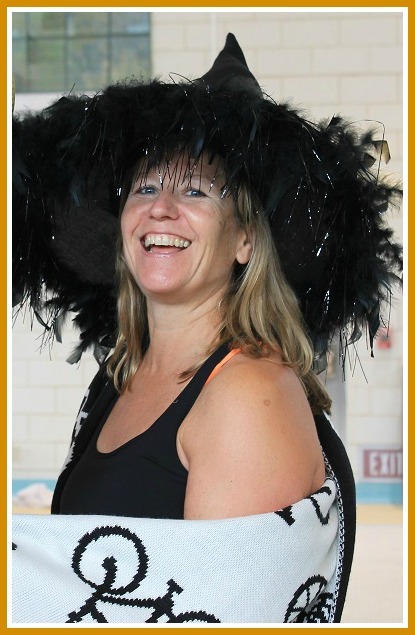 Patty Kondub, in her Aquafit Halloween costume. When someone is sick, she brings a card for the class to sign. She sings “Happy Birthday” (a lot!). Whenever she sees a news story about a class member — a new book they’ve written, a promotion, or just a brief mention — she tells everyone (and posts its on the bulletin board). Patty is no slouch. Her Aquafit students work hard. But she’s such a good teacher, they don’t even realize they’re getting a fantastic workout. Elsewhere at the Y, Patty helps coordinate indoor triathlons and special needs swim instruction. 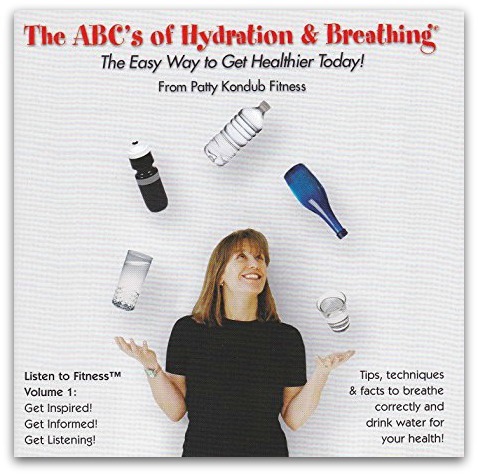 Patty Kondub offers hydration tips. Out of the water, Patty helped organize the Spin Odyssey that over 15 years raised hundreds of thousands of dollars for cancer research. Some of her Aquafit fans were involved. In her spare time (! ), Patty is the much-loved coach of the Staples girls golf team. She’s a past president of the Longshore Women’s Golf Association. And on Saturday mornings, she teaches a class for cancer survivors at CT Challenge. Patty Kondub always has a smile on her face. The next time you see her, smile back — and congratulate our latest Unsung Hero. BONUS FUN FACT: As a field hockey player, Patty was part of the first University of Connecticut team to win a national championship — in any sport. This entry was posted in Sports, Staples HS, Unsung Heroes, YMCA and tagged Aquafit, CT Challenge, Patty Kondub, Spin Odyssey, Westport Weston Family Y. Bookmark the permalink. a very good choice Dan.. a real energetic spirit… Kudos to Patty! I know Patty from the Mission. She is funny, sincere and a breath of fresh air! Patty is simply the BEST! She teaches every class with exuberance and full command of her music and her routines. Always fresh music, fresh ideas, fresh inspiration – every class is different, and always fun. We come out of her aqua fit classes energized and happy. But it is not just about fitness with Patty, it is about building community. All of us in her classes are encouraged to know each other, to support each other, and to care for each other. 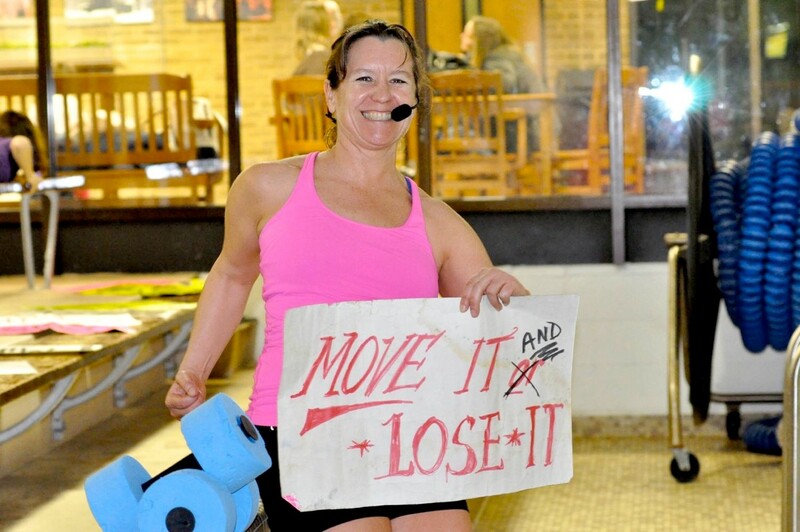 I am recovering from knee replacement and my aqua fit buddies have been cheering me on! I cannot wait to get back in the water with Patty. I haven’t seen Patty since Spin Odyssey stopped, but this is so great to see! What a great person to honor! Yay, Patty! I’ve part of Patty’s VIP class for years. Not really sure what the VIP stands for – we are more like the “island of misfit toys”……One has R.A., another M.S., another Parkinson’s, and me – multiple spinal surgeries. We come together twice a week where we forget our problems and work on our strengths. Patty is extremely knowledgeable and monitors/corrects us as we go. We play games and laugh a lot – celebrate each others birthdays, and send cards when one of us is absent for a while. Patty makes exercise fun – for 45 minutes twice a week we become children with not a care in the world. Patty can laugh herself (and us) out of any situation – it’s just who she is. My daughter had the privilege of having Patty as her golf coach at Staples. My daughter is long out of H.S. but her friendship with Patty remains to this day. Patty deserves to be recognized for all she does – from the pool, to Spin Odyssey, to Coaching the Staples girls golf team, to being a great friend. I feel very blessed to be the recipient of Patty’s friendship and love! So glad to see Patty here. For sure she is deserving of the title! What a wonderful, energetic, beautiful soul Patty is. As Staples Boys Golf coach I have seen her work with the Girls Golf Team the past years. Her energy and enthusiasm is infectious. The young lady golfers of Staples are lucky to have her as their Coach. His blog is the best in the land! Patty is an extraordinary individual who truly deserves this recognition. She is an amazingly positive member of the Westport community and someone who makes you glad just to be in her presence. Patty has made a great many lives better. There aren’t enough adjectives to describe her, she’s just that good! A friend, a mentor, a supporter, she is unique. and a great friend. Well deserved recognition for a true gem of Westport. Thanks Dan, for shining a light on Patty’s positive energy and good works. Patty is a shining star at the Westport Y and everywhere she goes. Why? Because Patty focuses herself on other people. She teaches, helps,coaches, advises, supports, cheers, and loves people. So of course Dan is right that “everyone loves Patty”. There are many takers, but patty is a Constant giver, i have much to thank her for, yes, she is the BEST! Patty is one of my favorite Westport people and her spin classes will always be a happy memory. Only Patty could make it fun to get up at 5 in the morning to stumble down to the Y in the winter dark. Thanks Patty! So I am thrilled that my picture of Patty is shown here! She is a very special lady who truly deserves this recognition. Thank you Patty for all that you do! She is a true treasure of a person and the best water aerobics coach ever!! Always a smile and support. Come join us in her classes at the Y. You won’t regret it!! I typically write these people off as “too good to be true,” but not any longer. I have the privilege of calling Patty my friend, and you captured her perfectly. Been to water aerobics (because her mom suggested it to nurse an ailing knee;) volunteered at Spin Odyssey; played many rounds of golf, and lots more. Her infectious jo6 of life got me to step out of my comfort zone time and again. Cheers to you Mr. Woog for sharing her. About 20 years ago I was involved in a fender bender on the Post Road. Patty was following behind and saw what happened. She pulled over, waited for the police to help me. I didn’t know her at all at the time. She was just being a responsible citizen. I have since gotten to know Patty through the Longshore Women’s Golf Association where she has been a leading member for many years. A wonderful tribute to a deserving person who is always wanting to a good deed for someone else. This blog and all the comments did such a great job describing how special patty is I couldn’t agree more! !, I have been coming to her water aerobics classes consistently for 20 years and Patty is the reason. I hope the ymca knows and appreciates what a gem she is. I think they and all of us are very lucky to have her…she is the best!! !